This unique puzzle will challenge even the most seasoned puzzle solvers. 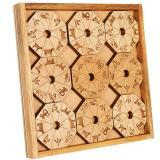 Made by a talented team in Florida, the goal of this wooden puzzle is simple: place the 9 octagon shaped pieces in the frame in such a way that all touching edges have a matching symbol. Symbols include a barn, cat, cow, horse, dog, chicken, hay, tractor and goat. A written solution is provided, but will arrive unsolved. The perfect gift for those that "have everything"! 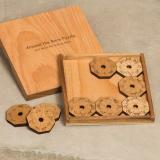 Symbols are precision cut into the wood, which is 1/4" thick alder, making this puzzle very strong and durable. Symbols include a barn, cat, cow, horse, dog, chicken, hay, tractor and goat. Length: 6", Width: 6", Depth: 0.6"
Priding themselves as being “The Land Before Nintendo”, the creative team that designs and develops these wooden puzzles are true pioneers in a niche industry. With an obvious passion for brainteasers and mind benders, a small family business makes each puzzle by hand in their Florida woodshop—a 4,000 square foot space containing both traditional woodworking equipment and high powered laser equipment. 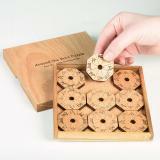 While new puzzles are being engineered and developed all the time, other designs are over a century old. Some puzzles have been resurrected after generations of dormancy. Although their puzzles can be complex, their focus is simple: to promote focus, problem-solving skills in a fun, timeless way. I love this compact puzzle. 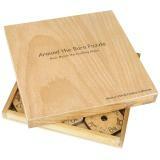 Also a plus having a nice wooden box. It made for a great birthday present.